Hajj is a duty required of all Muslim believers who can afford it: one of the five pillars of Islam along with the profession of faith, prayer, payment of charity and fasting at Ramadan. Hajj is a ritual journey to the Islamic holy cities of Mecca and Medina, during five days in the Hajj month (Zu'l-Hijja) that concludes the Islamic lunar (hijri) year. Each of its elements recalls an event in the lives of Ibrahim (Abraham), his female servant Hagar, their son Ismail (Ishmael) and Muhammad. In 2011, according to the Western calendar, Hajj began on Nov. 5. Hajj continues with the four-day Eid al-Adha observances in Mecca and in Muslim communities around the world. Eid al-Adha, known as Kurban Bairam among Turkic and Balkan Muslims, and as Eid-e-Ghorban in Persian, will last from Nov. 6 through Nov. 9. Eid al-Adha includes a special morning prayer service. The annual Hajj-month journey to Mecca is not the only way a Muslim may undertake a pilgrimage to Islam's most sacred site, which is the location toward which Muslims pray. Many of the faithful travel to Mecca for Umrah, a "lesser Hajj" involving fewer people and limited ritual practices. Umrah may be completed at any time during the year. With Muslims counting between 1 billion and 1.5 billion in today's world, one may ask why the full Hajj is only undertaken by some 2 million people annually. This is perplexing given the ease and low cost of air travel and the resources available to the Saudi authorities. But since the seizure of the holy city by the House of Sa'ud and the Wahhabi clerics in 1924, Hajj, which should be a glorious occasion in the life of every Muslim, has seen its capacity for spiritual fulfillment diminished. Before the Wahhabi takeover, Hajj travellers from Egypt came to Mecca accompanied by music, which the Wahhabis banned. In addition, distinctive customs observed by Shiite pilgrims were prohibited under the Saudis. The Saudi-Wahhabi rulers of Arabia have striven to make Hajj conform to their narrow conception of Islam, and to a considerable degree they have succeeded. 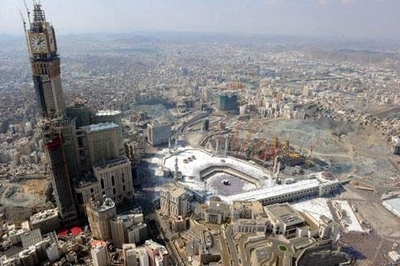 The Saudis restrict the number of pilgrims (hujjaj) coming into the kingdom, as a means of ideological control. 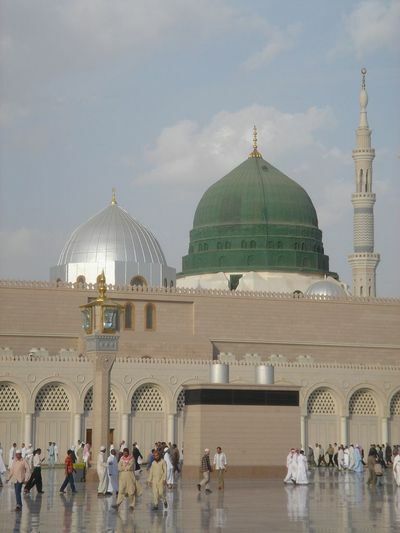 Those who go to the Prophet's Mosque in Medina to pray in praise of Muhammad, in a long-standing Hajj observance, are vulnerable to beatings and arrest by the morals patrols or mutawiyin if they commit the supposed heresy of praying in the direction of Muhammad's body, which the Wahhabis allege dilutes Islamic monotheism and imitates Christian worship of Jesus. Further, in a typical example of the dissonance between Wahhabi fundamentalism and Saudi ostentation, Mecca itself is now being transformed and the Hajj and Grand Mosque corrupted by development schemes. Modernizing social reform in Saudi Arabia is accompanied unfortunately by expansive construction projects that have so far included the erection of a "Royal Clock Tower" that overlooks and dwarfs the Kaabah, the black cubical temple in the Grand Mosque. While Hajj, as exemplified in the wearing of simple white garments by men, is supposed to embody Islamic egalitarianism, plans are advertised to surround the Grand Mosque with luxury hotels operated by Western investors, transforming Hajj into high-priced tourism rather than a profound religious commitment. Mecca is beginning to resemble the Moscow of the late Stalin era, if not Las Vegas, in its vulgar architectural gigantism. As tirelessly chronicled in global media by my colleague Dr. Irfan Al-Alawi, executive director of the Islamic Heritage Research Foundation, the Muslim architectural legacy of Mecca, represented by such buildings as the structure where Muhammad was born, the house of the Prophet's wife Khadijah, and the shrines and mosques of distinguished early Muslims, have been demolished. This vandalism, with the devastation of other architectural monuments in Mecca, is carried out on the pretext of enlarging the facilities for Hajj pilgrims, while, according to the Wahhabi hardliners, dissuading Muslims additionally from seduction into supposed "polytheism" by prayer at such places. Hajj has been marred by Saudi inconsistencies in fixing its dates, as well as recent Wahhabi attempts to segregate women from men in the processions walking around the Kaabah and to impose the niqab or face veil on female pilgrims -- a practice unknown in 14 centuries of Islamic history. In Morocco, Sufi women still sing enraptured melodies in praise of the Hajj pilgrims. But given the pall of disillusion that Wahhabism has imposed on Hajj, millions of Muslims from San Francisco to Singapore are satisfied to celebrate joyfully the Eid/Bairam holiday at home, while waiting for Mecca, Medina and Hajj to be freed from the grip of the Wahhabis and to regain their past splendor -- a spiritual, not commercial, illumination.